“Mathematics the Truth” is written by Malcolm Cameron, author of another book on mathematics “Heritage Mathematics”. 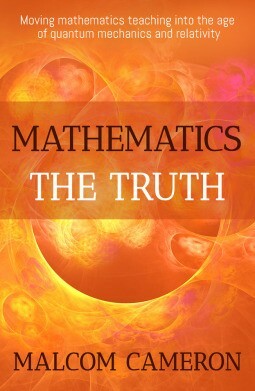 “Mathematics the Truth” is a book intended to help people learn modern mathematics. Its core premise is that mathematics has been taught by rote and that curriculum has always been a hundred years behind what is happening in the field. “Mathematics the Truth” covers topics ranging from subjects that we have been exposed to like irrational and complex numbers to the latest cutting research like Gravitational Waves. Along the way, we see Special and General Relativity, Quantum Mechanics and Infinity. Each chapter is a collection of diverse sub-topics grouped under the main topic. Typically, there is a bunch of questions to test your understanding at the end of each chapter. I liked the specific topics chosen by the author too (quantum mechanics, general and special relativity etc.). The references to the latest research (as new as 2016) also helped in solidifying the authenticity of the book. The questions and answers section at the end of each chapter was good to see too. While this was good, I felt that the explanations were lacking. I am an engineer and have studied these topics before. I found some of these chapters to be abstruse and terse. This book can become so much better if there are more detailed explanations and examples. I was drawn to this book by its core concept i.e. the mathematics being taught in school nowadays is out of date and we must learn the advancements in the last 100 years. I understand where the author is coming from since I have experienced this in my school and college days. Once this book is fully fleshed out (it feels like a draft now), this will be a book worth reading. I would like to see the author explaining some of the more complex math used, more anecdotes, and applications of these. Hold on until then.